The High Roller 2 Blackjack Table with a handsome aluminum trim, wood or high-grade Formica finish and stainless steel foot rail is like nothing else you'll find on the market. 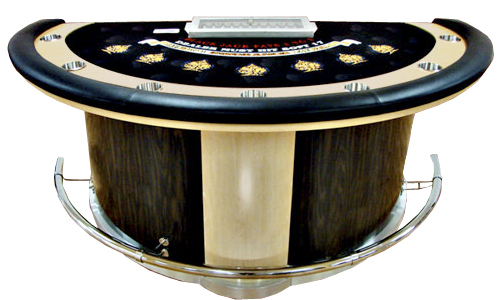 Each High Roller 2 Casino Blackjack Table is made in the United States, to your specifications, by master craftsmen. The Table comes standard with a metal chip tray and money slot, a professional quality layout, inset jumbo drink holders, a comfortable padded arm rest, and a sturdy metal foot rail. The High Roller 2 Blackjack Table measures 78" x 46" (Custom Blackjack Table sizes are available). We offer a broad selection of wood stain colors, including Mahogany, Ebony, Walnut, Cherry, Natural, and more. For Blackjack Tables with a Formica finish, we offer Cherry, Dark Walnut, Mariner Burl Blue, Red Burl, and many others. You can also choose from a wide range of vinyl arm rail colors, such as Black, Blue, Red, Cream, and Burgundy. Standard and Customized Blackjack Layouts are available. Call 1-800-233-0828 to Inquire About All Available Arm Rest and Layout Colors! For more information on our High Roller 2 Casino Blackjack Tables, please contact us at 1-800-233-0828. You might also be interested in viewing our wide selection of other Casino Blackjack Tables, which are all made in the U.S.A., from top-of-the-line materials, by master craftsmen.